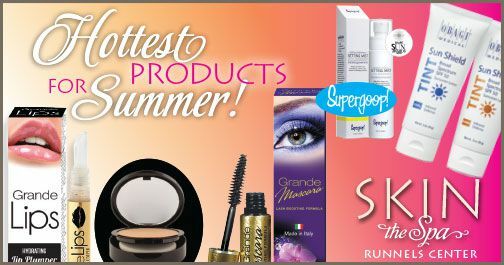 Hot Products for Summer 2016! We all know that sunscreen is a MUST. What we need to be reminded is that all sunscreen is NOT created equal. This technologically advanced formula protects skin against UVB and UVA radiation. Plus, it helps defend against heat-derived oxidative stress. Experience true plumping power. GrandeLIPS with active Ingredient Volulip™, gives you an INSTANT plumping effect within 3-5 minutes that lasts for hours. Additionally, with continued use, GrandeLIPS gives your natural lips the appearance of fuller, more voluminous, more youthful lips in 30 days. Make the most of your spectacular lashes with Grande MASCARA Lash Boosting Formula with Sympeptide 226EL, an exclusive formula made in Italy. Get instant extreme volume and length, plus healthier looking lashes from its unique peptide blend. This mascara is made with SymPeptide 226EL which stimulates keratin to fortify your lashes, providing length and thickness for naturally beautiful eyelashes! Grande MASCARA has an applicator brush made with the perfect combination of hard and soft fibers to lift lashes to achieve your desired volume. If you haven’t yet tried our signature line of cosmetics, now’s the time! Our Mineral Powder Foundation is perfect for the hot and humid Mississippi summer weather because of it’s silky smooth feel and application. Our cosmetic line is paraben free, hypo-allergenic, allergy tested, non-coedogenic, fragrance free and never tested on animals.